We’re just three days away from Dominion RiverRock, and if that sentence doesn’t fill you with a tingle of joy and anticipation, you’ve probably never been to this awesome festival of the outdoors. Let me tell you, friend: you’re in for a treat. The RiverRock Boulder Bash is the alliterative apex of my calendar year. Seriously – I’ve had this on my calendar since they announced the dates. I’ve been to a lot of climbing competitions, both as a spectator and a competitor, and nothing beats the Boulder Bash for scale and epicness. The thing that sets this comp apart from any other competition I’ve ever been to (and maybe any other comp anywhere) is the terrain. Instead of boring, flat walls, climbers have to make massive moves between plywood volumes suspended on scaffolding. In case that’s not cool enough, the scaffolding extends up at an angle, and competitors finish their routes twenty-five to thirty feet off the ground. Resolution deliberately low to avoid giving away too much. Come see it for yourself! This year, the field is full of old and new faces from near and far. 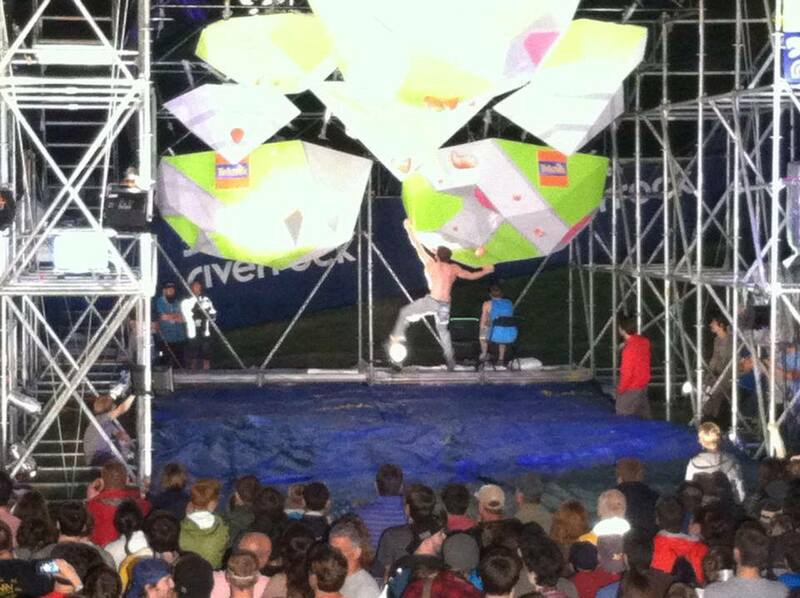 Last year’s winner, Chattanooga native Jimmy Webb, is going to be showing us how it’s done, but he’ll have still competition from big names like Vasya Vorotnikov and local heroes Ian Chavis and Austin Boze. Unconfirmed but rumored participants include North Carolina crusher Kai Lightner, fresh off his win at the Ring of Fire competition in Massachusetts, and Mister Five-Fifteen, Andrew Palmer. On the women’s side, last year’s champion Sasha DiGiulian is taking some time off from sending 5.14s internationally to pull on our plastic. She’ll be competing against Angie Payne, the first woman to send V13; veteran Boulder Bashers Leanna Lockhart and Tegan Wilson; and Richmond native and all-around sunshiney lady Kati Peters. There will also be a speed competition on Sunday afternoon, in case you were wondering what it looks like when folks who eat V11 for breakfast do when faced with a highball V1. Spoiler alert: it’s pretty spectacular. Ever watched the kayakers paddle smoothly down the James River rapids? Ever wondered what would happen if instead of going for style and grace, they went for speed and carnage? The Boatercross is a no-holds-barred downriver race to the finish line, where sneaky tactics and a little bit of shoving aren’t only encouraged, they’re practically required. The freestyle kayaking will be slightly more dignified, but no less fun to watch. A freestyle competitor is given a set amount of time to do as many tricks as possible on the VEPCO Levy rapids. Expect spins, flips, and wipeouts galore! If you’ve ever wanted to see what kayaking looks like when gravity isn’t a factor, check this out! Project Yoga Richmond is a donation-based yoga studio that focuses on outreach and spreading the good vibes to town. You may have seen their Saturday morning classes at the VMFA, you may have attended one of their classes, or you may have never heard of them – whatever the case, Saturday morning of RiverRock they will be hosting a mixed-level vinyasa class that will get you psyched to be outside! All levels are welcome, and if yoga isn’t your thing, you can still come watch – it’s very soothing to see a hundred folks all doing Warrior 2 on the banks of the river. It’s another climbing photo because you needed to see this. 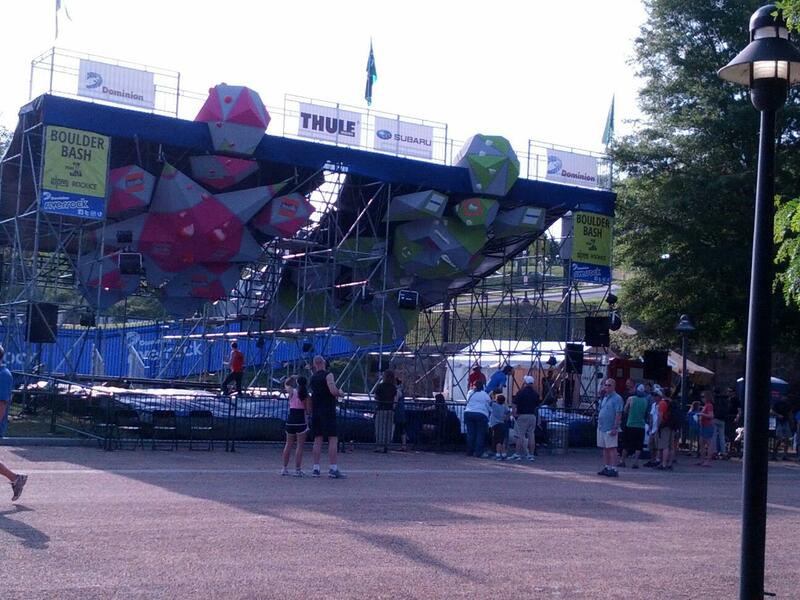 This entry was posted in Competition, Outdoor Climbing and tagged RiverRock, RVA. Bookmark the permalink.